I obviously don’t have much to write about these days. We’re parked in Fort Lauderdale. I see my Mom nearly every day. Jim is working in the office. We both spend hours answering emails and managing our family of websites every day. But, here’s the thing … I keep staring at my shiny fingernails! And feeling how smooth they are. I took my Mom to the mall the other day, she bought a new pair of shoes and we had a nice lunch at Seasons 52 – yum! While we walked the mall one of the vendors in a kiosk approached me and said, “let me see your fingernails” Oh NO … my fingernails are disgusting – I don’t show them, I hide them. If you looked at my fingernails, you would figure I must work as a gardener – they’re dirty and broken. Once a year (approximately) I file them down a bit whether they need it or not! The last time I got my nails ‘done’ was for my wedding 13 years ago! He wouldn’t take ‘No’ for an answer … very annoying! But I relented. He grabbed my hand and started rubbing a fingernail with a special little block. One side of the block had a blue material – he said ‘Buff your nail with this side for 15 seconds.’ Then he turned the block to the red side and buffed for another 15 seconds. The third side was white, he said it was silk. After 15 seconds buffing with this side, my fingernail came out smooth – ridge-free and SHINY. I mean really shiny … like I had just polished them with clear nail polish! He went on to demonstrate the cuticle cream etc. The kit was $20. I bought 2. I spent less than 10 minutes using each side of the block to buff all 10 fingernails. It’s magic! I’m simply fascinated with my smooth, shiny fingernails. We are in our ‘Home’ park of Paradise Island RV Park in Fort Lauderdale Florida. It was only a few blocks from here where we used to live in a house. We sold that in 2003. We’ve spent a few winters in Arizona / Texas / S California, but we always come back to South Florida sometime during the year. Jim work-camps here in the office on Wed/Thu/Fri, handling phone calls and RV-site reservations on the RV Trip Setter software … a great job for him! And, it gives me the RV to myself :-) … or the car to go visit my Mom. Since we know we’re going to be here for several months (till March), we contracted with AT&T to activate a DSL line to our site for $20/mo. OH BOY!! Real Internet. Fast. Unlimited. We are going to be so spoiled by the time we leave for next summer. In addition to enjoying the dependable speed when working on our websites, we are now watching Netflix movies using the Internet connection thru the Wii – so it’s all hooked up to display on our big screen and play the sound thru our Bose surround sound. I went to my Women’s Executive Club luncheon today and we went to our Kayuba dive club meeting last night. Pretty soon it will start getting wintry/windy here so we are taking advantage of the still summer-like days to go Kayak Diving. We have a lot of work to do on our websites, and I need to get busy and record some more tutorial videos. During the summer, when we’re spending so much time presenting at rallies and traveling, we don’t post many new videos on our website for our members. Now that the summer tour is over (and we have a lot of new members) it’s time to buckle down and produce some more videos. After all, a lot has happened in the Picasa / Blogger / Windows 7 / Facebook / Streets and Trips world. Not to mention Internet connections and Droids! We started using new Membership site software (Wishlist Member) in August as well and we have a lot to learn about setting it up so that it is easy for us to create new content, and easy for members to watch the videos and use the Forum. The hardest part has been the transition from the old to the new. There are some things I really preferred about our old system – but the new one has a lot more options that we want to use. Jim and I have signed up to attend a conference in Las Vegas December 3-5, where we hope to learn a lot about using Wishlist Member. It’s a lot of work, but it’s all good exciting stuff. And, what a great way to make a living – doing what you love (teaching computers) from wherever you love to be! You *know* we prefer RVing! And, I hate the lines on cruise ships. But, cruising has its advantages. The main one is, of course, that the big cruise ships make it convenient to visit wonderful places for a reasonable price. Cruising is a great way to share travel with your extended family. It’s comfortable, and nobody has to cook or clean! There’s plenty do do for the active people, as well as for the inactive. Find a cozy corner or a deck chair and just read, or take shore excursions that include hiking or biking. It’s totally up to the individual. It’s a great venue for conferences. This cruise was sponsored by the Parkinsons Research Foundation. We went because Jim’s Dad has Parkinsons. I think the group was about 40 or 50 people. They had seminar rooms with topics scheduled on 4 of the 7 days of the cruise. Some of our group attended several of the seminars, some attended none. We all enjoyed the experience of visiting Alaska and seeing the awesome views. We all enjoyed the food and other amenities of shipboard life. Jim and I kept thinking, “This would be a great way to host a Geeks on Tour Picasa conference!” Everywhere you look people were snapping photos. We showed several people how to find settings on their cameras like ‘video’ or ‘backlight.’ Wouldn’t those people love to attend a seminar each evening of the cruise to learn more about managing their digital pictures with Picasa? My sister-in-law took advantage of being with us on the cruise and we scheduled a one-on-one session with her, her camera, and our computer with Picasa. We showed her how to tag her photos with the name of each excursion, explained how Picasa folders and windows folders are one and the same, and demonstrated how to make pictures look better and why you don’t need to save those changes. You go by the metropolis of Skagway with 800 residents, and you see the cemetery. But the best vantage point was outside, standing on the platform. ﻿When the ride was over, we had an opportunity to speak with the young woman who was the tour guide. Since we were the last cruise of the season, this was her last day of work. Born and raised in Skagway, she was headed out the next day for university life in Seattle. She said she was going to medical school. Since we heard that Skagway had *no* doctor, we asked if she was planning to return and change that. "No," she said, she was going to learn to be a plastic surgeon and specialize in bear attacks! yikes She, and many of her friends, were leaving Skagway for good. 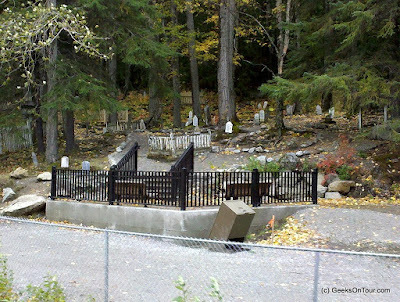 I mentioned that her family must be very sad about that, and asked how many family she had here in Skagway. She said that she was related to just about everyone in town - except her fiance - and they'd gone to great lengths to be sure of that! We learned several other tidbits of local lore from her. Like the quaint tradition of mooning the last ship of the season! And, in regards to the fact that there are 10 men to each woman, she taught us a new line. In addition to the advice to women that "the odds may be good, but the goods may be odd" she said that "men don't lose their girlfriend, they lose their turn"
So, we had a great time in Skagway, then it was back to sea for a whole day. As I mentioned, we were on this cruise because it was sponsored by the Parkinson's Research Foundation. They had several seminars and workshops during the week. 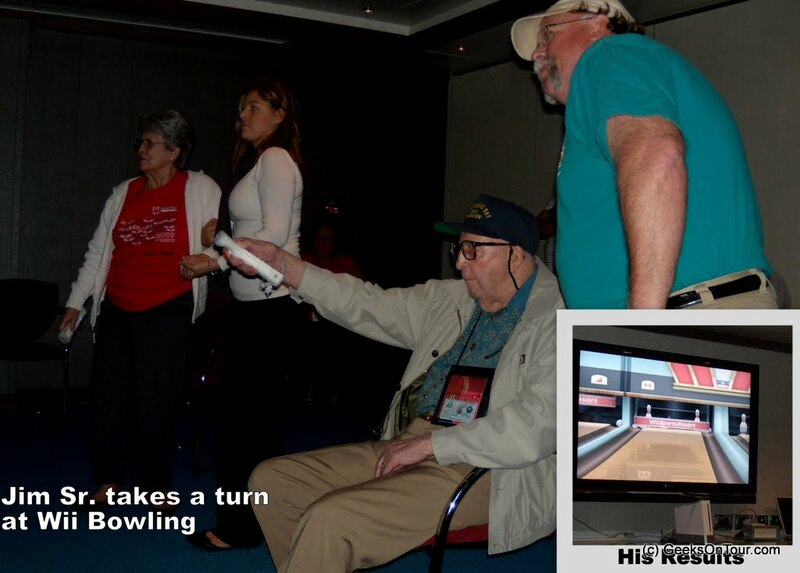 One was about how the Wii is a very useful machine for allowing Parkinsons patients to enjoy something like bowling, even while sitting down. Here's Jim's dad bowling - he did pretty good! 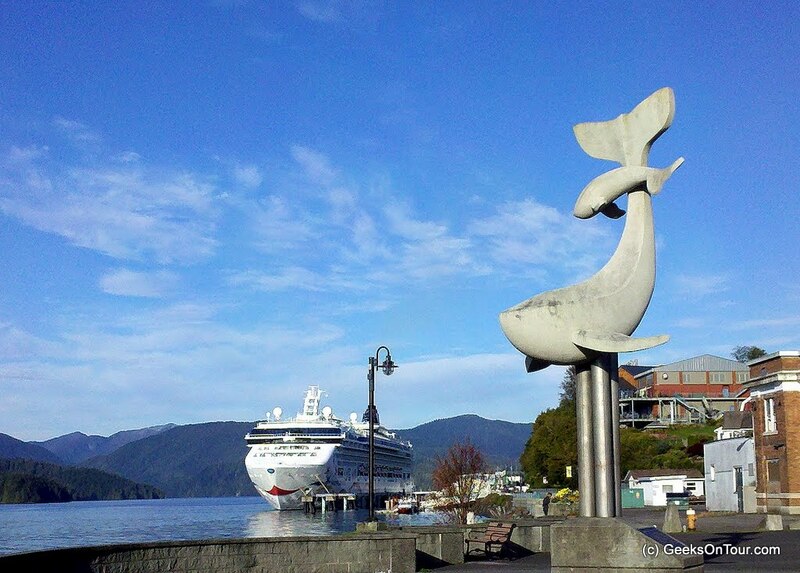 The last stop of the trip was Prince Rupert, and we had brilliantly gorgeous weather. Here's a slideshow of all the good pictures from the trip. You can click on this and go to the Picasa Web album for larger pictures. We’re back! Here’s the itinerary of the trip we just took. We started in Seattle, made stops in Ketchikan, Juneau, and Skagway on the way up – then Prince Rupert on the way back. We ended the cruise in Vancouver, then took a bus for about 4 hours back to Seattle to fly home. We took this particular trip because it was organized by the Parkinsons Research Foundation. Jim’s Dad has Parkinson’s Disease. The Bahamas cruise we took last January was also a Parkinson’s cruise. It worked well to have the extended family do this trip together. There were 7 of us all together … Jim, Jim Sr., Me (Chris), Mom (Marilyn), Jo Ellen (Jim’s ex-wife), Debbie (Jim’s sister), and Bob (Debbie’s husband.) Jim roomed with his Dad, and I roomed with my Mom and Jo Ellen. I’ve visited Seattle several times in the past – actually lived there when I was 5 – so I knew how spectacular Mt. Rainier is and I was prepared with my camera in the plane. We stayed the night at a Holiday Inn near the airport, then transferred to the Norwegian Star cruise ship on Saturday morning. Here’s the view of Rainier from the ship. In Ketchikan Mom, Jim and I signed up for a boat tour to take us into the Misty Fjords Nat’l Monument. 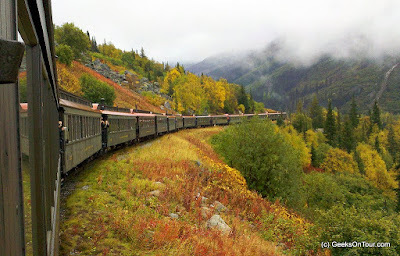 It was cold, rainy, and windy – but that’s OK, it felt like we were really experiencing Alaska! And the Fjords were SO beautiful! We took a tour on a jet boat – very comfortable inside, plenty of room outside to get a better view. Back to the Norwegian Star cruise ship. I think the ship is bigger than the town! Juneau is the only US State Capital that is inaccessible by road. You must either fly there or go by boat. On the way to Juneau, the cruise ship took a special side trip to Sawyer glacier. What a sight! On the way up the fjord, we were taking an exercise class … does your gym look like this? I love exercise classes on cruise ships – precisely for the views – but this one tops ‘em all. I’m glad I have my Jimmy to keep me warm! Everywhere you look were more views of glaciers, rock walls, and waterfalls. Look at that Blue ice! This is Jo Ellen with a view from the Tram. No, this one is not a painting … although it should be! After the tram ride and a beer at the mountaintop restaurant. We were told we had to stop for at least one more beer at the Red Dog Saloon – while the moose on the wall watched us!